MLB Commissioner Rob Manfred said Reds Manager Bryan Price opted not to challenge a game-ending missed call resulting in a Reds loss in St. Louis on September 29, noting (as we did in our analysis on the night of the incident) that Price failed to timely seek out the umpires after they left the field on the walk-off double. Replay Regulation II.D.1 specifies that, "A challenge to a play that ends the game must be invoked immediately upon the conclusion of the play, and both Clubs shall remain in their dugouts until the Replay Official issues his decision." There was a call. It was missed. Replay was available via manager challenge, and the manager, if you think about it, the manager elected, right? Or did not opt to challenge within the confines of a clearly defined rule. It says 'immediate' in the rules. After losing the game, Price blamed MLB's timeliness rule, opining that 10 seconds (or, for the purposes of II.D.1, "immediately") is not enough time in which to decide or discover whether to challenge a game-ending call. Manfred disagreed and said that, "Bringing folks back out on the field after some of those things [walk-off celebrations, etc.] have happened in order to continue a game because of a replay call is not appealing." He also reasoned that, "If a manager has a challenge left and it's the last play of the game...there's no reason to hang around and figure out whether you want to use your challenge. You're either using it or going home, one or the other. There's no real reason for delay." 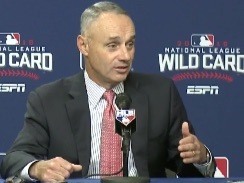 In sum, Manfred said he didn't consider the incident as "indicative of any problem with the replay system."